I really enjoyed Austin Pendleton's play about the theatre and Orson Welles the great film director of Citizen Kane and actor in Carol Reed's The Third Man. Pendleton's play is a fiction but the characterizations seemed to me to be sound. Pendleton had spent a couple of weeks with Orson Welles in the desert on the set of Mike Nicholls' film Catch 22 and this play has come from that experience. Orson's Shadow is set in 1960 when the Royal Court is to put on Rhinoceros, Ionesco's metaphorical play about the growth of fascism, starring Laurence Olivier (Adrian Lukis) and his future wife, the Northern and rather plain actress Joan Plowright (Louise Ford). Here the critic Ken Tynan (Edward Bennett) brings Welles and Olivier together after the original director was to be Tony Richardson. Tynan doing this is fiction but the real life critic, infamous for saying the F word for the first time on British television, but in truth a critic whose reviews made wonderful reading, did review the resulting production of Rhinoceros. Pendleton has put together the break up of Olivier's marriage to the beautiful but bi-polar Vivien Leigh (Gina Bellman) with the battles over Rhinoceros because at this point in time, Olivier's marriage was on the rocks and he sought comfort from the homely Joan Plowright, as down to earth as Vivien Leigh was ethereal. Laurence Olivier had scored with his film versions of Shakespeare's Henry V and Hamlet but Orson Welles' Macbeth was less successful. The difference was that Olivier's was a more faithful interpretation of the stage play whereas Welles's was a cinematic production. It's all down to artistic interpretation. The play is chockfull with wit and aphorisms, especially from Edward Bennett as the critic, a good physical likeness to Tynan himself whose smoking sent him to an early death aged 53. We have this clash of artistic ideas between Welles and Olivier, and in the second act as they rehearse, we see Olivier dusting the furniture. Olivier had successfully filmed a modern piece, The Entertainer and agreed to Rhinoceros to cement the idea that he could act in a modern play as well as the Shakespearean work he was known for. Welles agreed to direct anything Olivier was in after the Dublin production of Chimes at Midnight failed to transfer to London, although Welles admitted he didn't like the Ionesco play. I think Olivier comes off worse in this production. 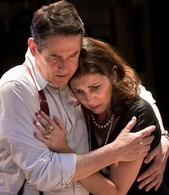 Early in the play a long phone call with Vivien sounds like a scene from Private Lives. We note Olivier's patrician accent contrasting with his frequent use of four letter words. I enjoyed Olivier's brooding resentment about Tynan's criticism of the Cleopatra film he made with his wife in 1950. Tynan responds by telling him to read the reviews more carefully. These theatrical in-jokes are a delight. Adrian Lukis is a reasonable likeness to Olivier but John Hodgkinson's Orson Welles is very credible. It is a shame that Louise Ford isn't plainer and more northern to contrast with Gina Bellman's Vivien, who prefers to think of Olivier in a velvet smoking jacket. Orson Welles wasn't the first director to be undermined by Olivier. The same thing had happened to John Gielgud. Olivier told Orson Welles in front of the whole cast that he should not come to rehearsals because he was upsetting them so much and so, although Welles was credited as the director, he was banned from the dress rehearsal of Rhinoceros. Pendleton's play works well as a study of witty theatrical egos in conflict. For Elyse Sommer's review of Orson's Shadow in New York in 2005 go here.